Actually the Samsung Galaxy S3 is made of polycarbonate! This is straight from Samsung's mouth: "Polycarbonate is used on the battery cover. Polycarbonate is lightweight, solid and is already being widely used in the mobile industry. It was chosen as the best material to represent the minimal organic design of GALAXY S III. Using three layers of high quality, pure and clear polycarbonate, not only is the phone’s aesthetic elevated, but the durability and scratch resistance is maximized." I can't emphasize on how interesting it would be to see how the displays of the SGS III, HTC One X and SGSII look like next to one another. It's the only thing I'm interested in really. When will all these "versus" ever going to stop? Of course the S3 is better. It's a no-brainer stuff. Nice comparison to read. Now both the HTC One X and the SGS2 were covered against the SGS3. That's probably all I needed. I just need to wait until the Note 2 comes out, with that form factor and digitalizer, but the horsepower and some of the features of the I9300 (Smart stay and Direct call ftw). Nitro, 24 May 2012Yeah, this pretty much hits the nail on the head. I have the original Galaxy S, and it is amaz... moresame boat, i got the original galaxy, it was mile better than the original iphone in every department except the design. I love s3, I preorded a blue one already, but red in one test about overheating after longer use. what can you say to that? i also red few articles that s2 was also overheating. "We'll be honest - it doesn't look quite as inspiring as some of its competitors that pack fancy polycarbonate or aluminum unibodies. ", you are totally wrong because the S3 backpanel IS actually "fancy polycarbonate"! The Wolfson DAC and the Voodoo drivers by Supercurio will give S3 perfect sound quality! 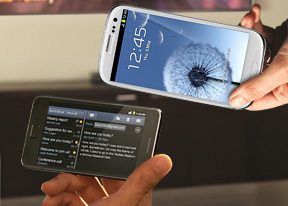 Why not also compare with Galaxy Note??? What will happen to the phone after "two, three years"? (page 3)? Yeah, this pretty much hits the nail on the head. I have the original Galaxy S, and it is amazing to see how far the range has come. I really loved the SII and felt attached to it even after the latest incarnation manifested itself. But now, past besides me, I've come to the time to upgrade (damn 24 month contracts! ), and I'm more than happy to take the SIII. It surely is the better phone overall. Oh, as is internet tradition, FIRST!